2. Add sugar, salt and buttermilk; then flour, soda and baking powder which have been sifted together. 3. Last, fold in stiffly beaten egg whites. 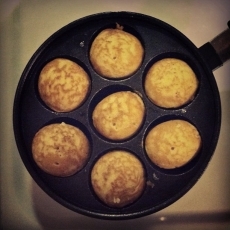 Place small amount of fat in each cup of the aebleskiver pan and fill 2/3 full of dough. 4. Place a small teaspoon of apple sauce on top of dough, then barely cover apple sauce with a few drops of dough. 5. Cook until bubbly, turn carefully with fork and finish baking on other side. 6. Serve with butter and maple syrup or jam. 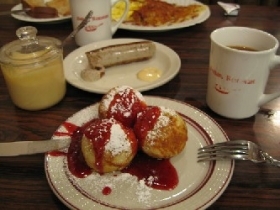 NOTE: AVOID spilling apple sauce in cups, as this will cause the aebleskiver to stick.